It is easy to walk past the Merton War Memorial without taking a second glance at the names listed. As the 100th anniversary of the outbreak of the First World War approaches, however, we've been taking the time to find out more about the men who lost their lives in 'the war to end all wars'. 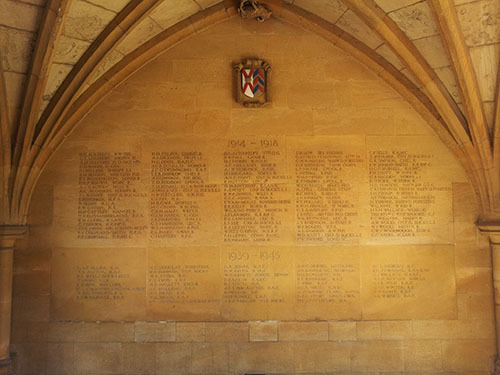 There are 109 names listed on the Merton War Memorial under the dates '1914-1918', among them six College servants, a Fellow's son, an Olympic athlete and two German Rhodes Scholars. To reflect the equality of their sacrifice, none of their military ranks are listed on the memorial. What follows are a few of the faces and stories connected to the names. Do you have any more information about any of the names on the Merton War Memorial? Are you perhaps a descendent or an enthusiast with stories to share? Add your story to the Merton@750 Anniversary Collection and help us tell the tale of Merton at War.